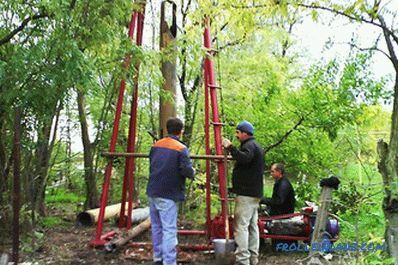 Let's look at the technology of drilling wells for water, how such work is done today, and how this knowledge can help the layman. Of course, it was it would be unwise to study for a long time, learning all the subtleties of creating wells, so that someone else could do this work, and with a personal participation in the work, such amount of knowledge is not needed. 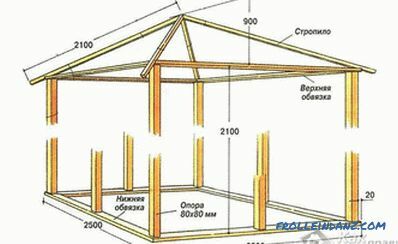 Nevertheless, the drilling technology, at least in a simplified form, is necessary to know, because it will be a protection from mistakes, and from deception by dishonest performers. They differ in the ways of destruction of the soil in the well, as well as in the methods of rock extraction. 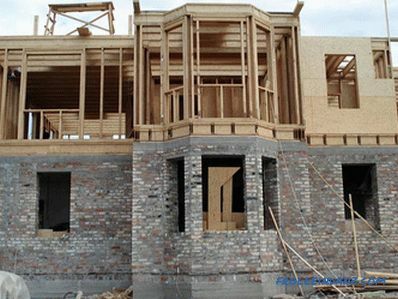 This, of course, affects the cost of the work, and what the site will look like after each type of equipment. Let's look at technology in more detail. This method is considered to be the cheapest and simplest. Therefore, the demand for it is higher, which affected the formation of brigades, whose representatives will insist on such drilling, because in case of refusal they will remain without work, since other equipment is often not available. This technology is acceptable only for soft rocks. 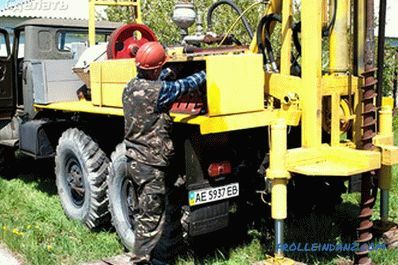 A small-sized drilling rig is used for work, which a small truck can deliver. 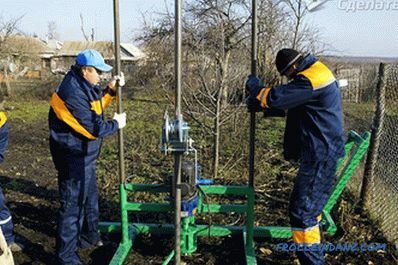 Having assembled the equipment in a quarter of an hour, the team immediately proceeds to work. The auger enters the ground, and due to the fact that it is a kind of screw, the earth easily rises to the surface with its blades. The landscape remains virtually untouched, and it is easy to restore order after the brigade leaves, especially when the well is less than 10 meters and the work was done without drilling mud. Now this technology is the most common method of setting wells for water. What is she like? 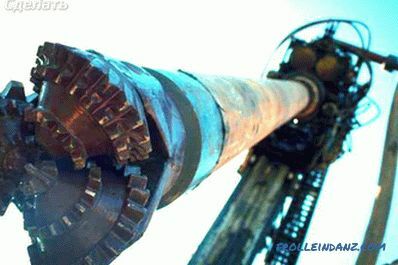 A special drill pipe is used, inside of which there is a rotating shaft with a tip - a chisel. It is this tip that sinks deep. 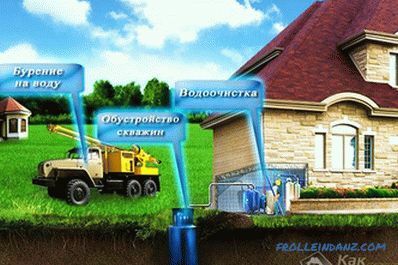 The system works by means of hydraulic installation. This method allows you to drill almost any rock, even at great depths. The principle of operation of such a drilling rig is based on the destruction of a brown layer of soil inside the casing, and washing it out of the well with drilling mud. With the help of this technology even fragments of underground rocks are destroyed. For a better opening of the aquifer and for obtaining more efficiency, backwashing will be required. As early as 2-3 weeks after the start of work, it is possible to do an analysis of artesian water, which should be enough for one household. However, this method is the most laborious, and is performed on more complex equipment. For this reason, drilling wells using backwash is usually expensive. Such an installation has a large mass, so it is placed on the platform of powerful trucks MAZ, ZIL and the like. The movement of heavy machinery around the backyard will greatly change its appearance. 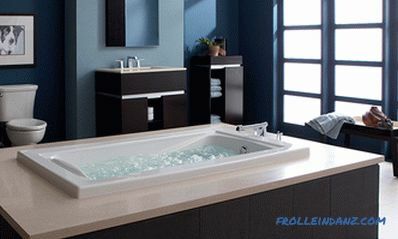 This technology allows you to break through to the aquifer with great effort. 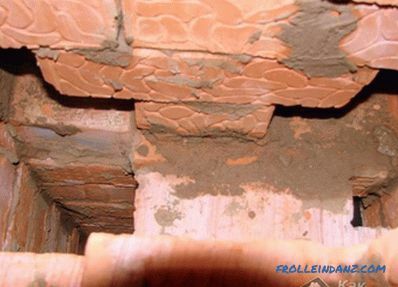 Although this method is very old and not fast, it nevertheless remains the highest quality method of well construction. The essence of this method is that the soil is destroyed by a heavy projectile, which falls from a certain height, and cuts into the ground. When pulling the projectile its internal cavity is cleared, and the process repeats. If the soil remains in the well, then the shell is used, but most often they are combined in one projectile. Work is carried out until the water layer is sufficiently opened. The advantage of such drilling is that there is a "dry" operation, since no solution is used. This contributes to a more accurate dissection of the aquifer and provides the maximum possible effective life of the well over 50 years. Very often our choice is limited by the opportunity companies providing their services for which time is money. What you can earn and is advanced technology, so you can hardly find specialists with a cable drilling rig. Most likely, you will be offered to work on a small-sized drilling rig, or will be offered rotary drilling, which is used in 8 cases out of 10.
how to make a summer shower.